If "Touring Makes You Crazy" Then This Movie is Proof! 200 Motels is Frank Zappa's outrageous, psychedelic precursor to the birth of the music video - his hilarious response to the burning question of what to do with road-wrecked musicians. Should they rip off the motel's towels and ashtrays or merely quit the group? Dare they rebel against the tyranny of the merciless Zappa? 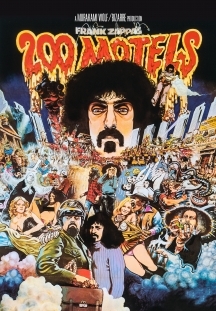 "The Mothers of Invention," as irrepressible as Zappa himself, wreck havoc in Centerville, a "typical" American town with its Rancid Boutique, Cheesy Motel, Fake Nightclub, Redneck Eats Cafe, groupies and an honest-to-goodness Main Street. Ringo Starr, in Zappa disguise and carrying an oil lamp, narrates. Theodore Bikel is government agent Rance Muhammitz. The cult classic comedy / fantasy / musical returns to DVD! 200 Motels is a kind of magical mystery trip through all the motels, concert halls, cities, states and groupies of a road tour of the Mothers of Invention... It is a wall of sight-and-sound input, and the experience of the input... It assaults the mind with everything on hand... The movie is so unrelentingly high that you even wish for intermissions. A warts 'n' all snapshot of life in Zappa's touring rock circus. Along the way Frank indulges in time-locked psychedelic frippery, and there's a certain amount of dodgy cavorting with the groupies.